It’s not like anyone would need any other reason to go to the Frankfurt Motor Show. This annual event draws countless visitors from every corner of the world. This year, the show is being held from the 13th of September to the 25th. And this year, there is an added bonus to going to the show – thanks to car manufacturer Audi. 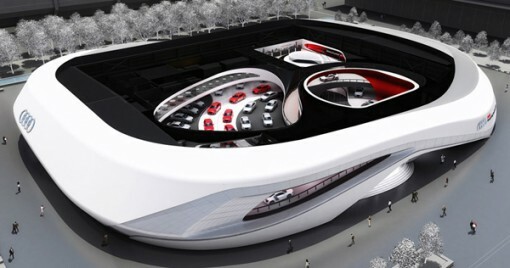 The Audi Ring, as pictured above, is a temporary building created especially for this event. ((Via)) Of course, something so breathtaking ought to be used for more than one show, don’t you think? 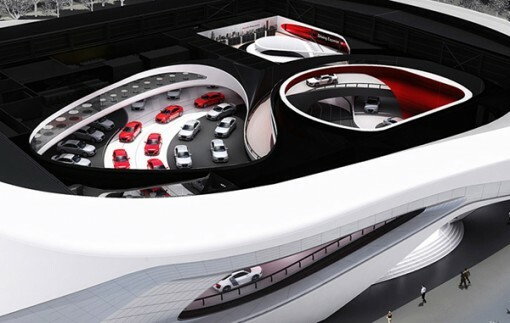 I suppose the organizers think the same way as the Audi Ring is going to stay put till October so that it can be used for the Frankfurt Book Fair. From cars to books – why not? The Audi Ring measures in at 100 meters long, 70 meters wide, and 12 meters high. Yes, it has more than enough space to accommodate the cars, drivers, and visitors. Inside, there is a test track, which is 400 meters long. You can see this track in the image below. Visitors to the show will be able to actually take a ride in real cars – Audi, of course. The cars range from existing Audi models and future ones – definitely a once in a lifetime experience! I think the catch is that you can’t drive a car yourself. Instead, one of the may professional drivers will be showing off the cars and the track. This is but understandable – the last thing you want is to have an overeager visitor wrecking a car, and worse, the track. Here’s another view of the Audi Ring, just to show how sleek it looks. 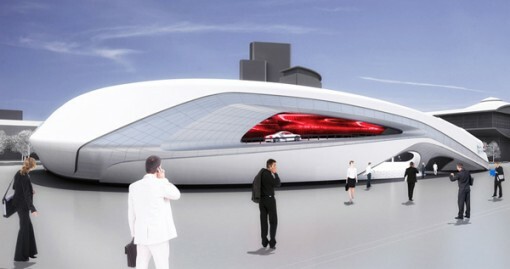 I don’t know about you, but I wouldn’t mind going to the show just for the Audi Ring experience!